Maintenance is the routine job for keeping sewing machine fit for garments manufacturing. Every factory assign maintenance team to ensure the proper functioning of a sewing machine. Sewing Machine maintenance team make Schedule and take preventive action. Proper maintenance of sewing machine will ensure the long-lasting service. For this reason, sewing cost per unit will be less. This is the reason importance is given for sewing machine maintenance in garments. Needle thread, bobbin thread or looper thread should be threaded correctly and their tension should adjust properly. Essential parts of the machine should be lubricated or oiled regularly. Using correct needle number by pre-experiment with fabric before bulk production and needle adjustment should be correct. During fabric feed and with a drawl, the needle should be picked at the topmost position and the pressure foot is lifted. 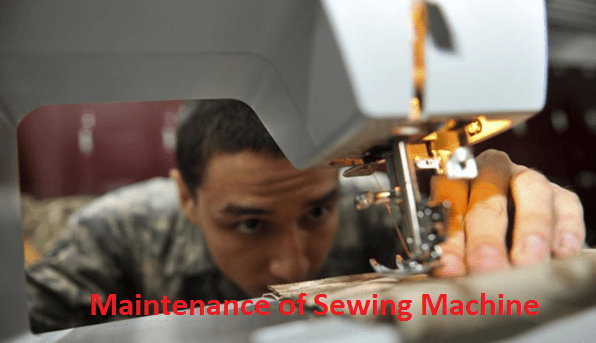 Hopefully, this article will be helpful for a person who works with a sewing machine and who is responsible for the maintenance of the sewing machine. Tagged How maintenance of sewing machine, How to ensure long lasting sewing machine, increase sewing machine efficiency, List of Work for Preventive Machine Maintenance, List of Work for Preventive Sewing Machine Maintenance, maintenance of sewing machine, Objectives of Sewing Machine Maintenance in Garments, Sewing Machine Maintenance, Sewing Machine Maintenance in Garments, Sewing machine maintenance in Garments pdf.